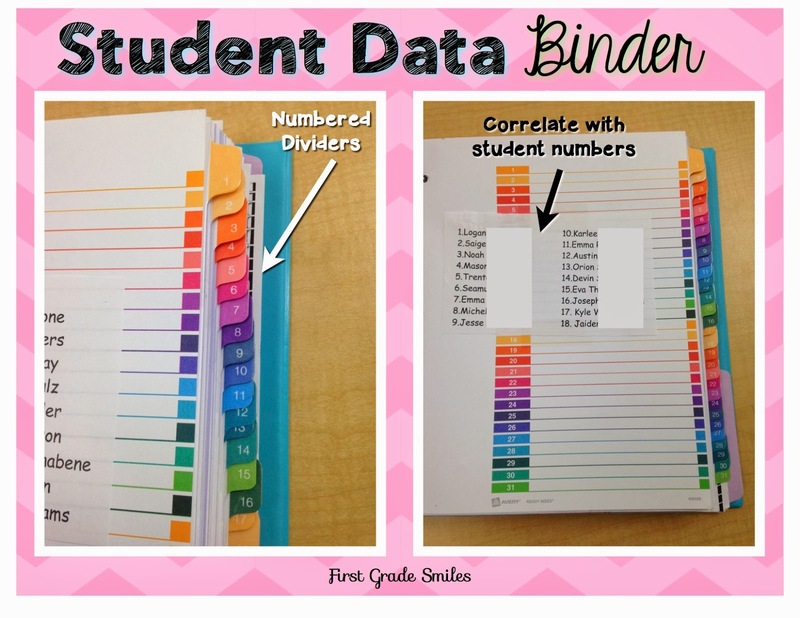 Today I'd like to share a teacher tip of how I organize my student data in my classroom. In the days of Common Core, RTI, APPR, and whatever else is out there that I'm forgetting, a teacher can go a little bonkers trying to keep track of everything and have the evidence needed to support student performance. It can be exhausting and stressful just gathering all the data you need, but it can also be challenging finding a way to organize that data once it's collected. This year I decided to keep an all-inclusive Student Data Binder. To get started, I went to Office Max and got a large binder - mine is only 2 inches and I think I need to upgrade to a 3 inch binder. I also got these numbered dividers. In my classroom, I assign numbers to students from the first day of school and we use those numbers for a lot like our lunch choices and behavior chart. The dividers come with this Table of Contents page, so I laminated that page and each year I will just tape in a copy of my student's names and numbers into it. This way I can reuse it for as long as it will last. I have tried to include as much into this binder as I can so I have one place to go when I need information on a student. One thing I keep in the binder is any and all parent communication (that is not in an email). I bought this 3-hole punched, plastic zipper pouch at Dollar Tree this summer and they are awesome. They are very sturdy. This one is in the front of my binder and I put any notes that parents send in throughout the year. I keep them all! The only ones I don't keep in this pouch would be excuses that go to the office. I'm always surprised when I need to go back and look at a note, whether it's to grab a phone number or email that I can't find anywhere else or if I just need documentation of correspondence with parents- I am always happy that I keep them. Under each student's tab I also put in the parent letters I have parents write to me in the beginning of the year about their expectations, goals, and concerns. I also keep our parent conference notes and other notes I take when making phone calls. This is so helpful during report cards to remind myself of what our goals are for each child and what I've already discussed with parents. 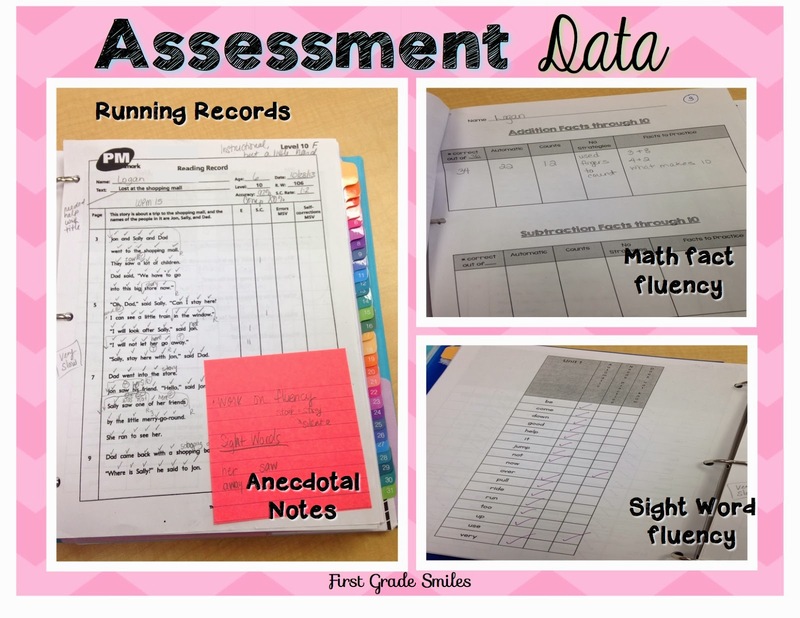 I also keep each student's assessment data in my binder. This includes running records and other testing documentation like AIMSWEB or informal assessments. I also tend to write anecdotal notes on post-its during guided reading or math and then I can just stick them in the student's section so I don't lose them. I don't keep copies of the actual assessments in my binder because they take up way too much space. I keep these in a crate with numbered file folders. So in my binder I do keep any grading sheets that have the scores for these assessments on them, but the tests themselves get filed away. (I don't have a picture of my grading sheets, but they are very basic). The last thing I keep in my binder is behavior data. I use a card system in my room for behavior. Each day I very quickly take some markers and document what color card each student was on. I will often write a quick note as to why they were on a different color or again use a post-it and stick it in there. I keep these so I can look back at trends, for report cards, and so I can share this with parents if I need to. I allow students to earn a sticker when they are on green and then earn a reward when they get to 5 stickers. It might seem like it would take a lot of time, but actually it is only about 2 minutes at the end of the day and it is SO important to reinforce the child's behavior for the day - especially the positive! So that's about it for my Student Data Binder. It has really helped me stay organized this year. I can grab it when I have conferences or if I need to bring a student up for intervention support. Last week when I was finishing up my report cards for the quarter, I was so, so happy to be able to grab this binder and just get to it. I hope you saw something that you could use in your own classroom. If you are looking for more Bright Ideas, you should check out this Pinterest board by clicking on the picture below. You will find tons of great blog posts filled with Bright Ideas for the classroom. Thanks so much for visiting. 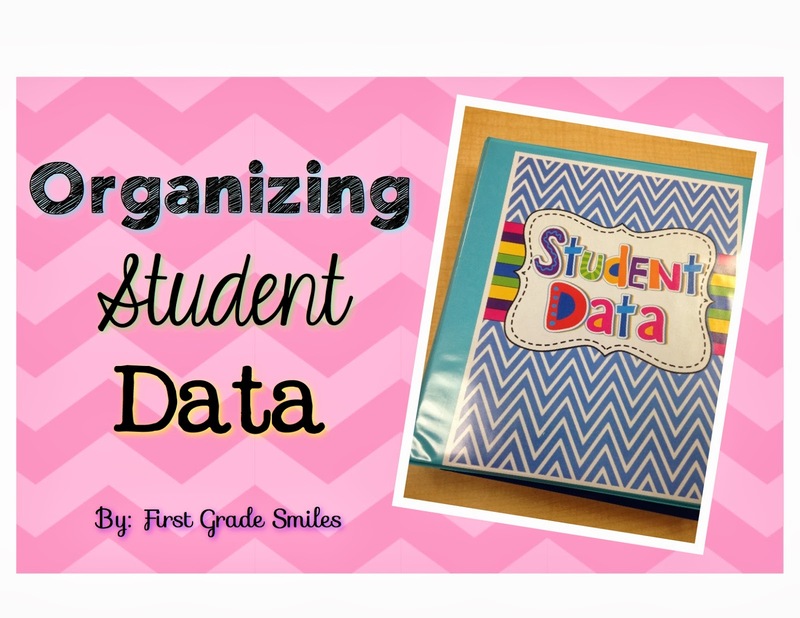 I'd love to hear any other great ideas you might have on how you organize your student data. So organized - I love it! I may need to try this! I have a data binder as well, but love the additional organizational items you have to make is easier to use. Thanks so much. I love this - so organized! I use hanging folders right now, but this would be so much easier to access. Thank you for sharing! 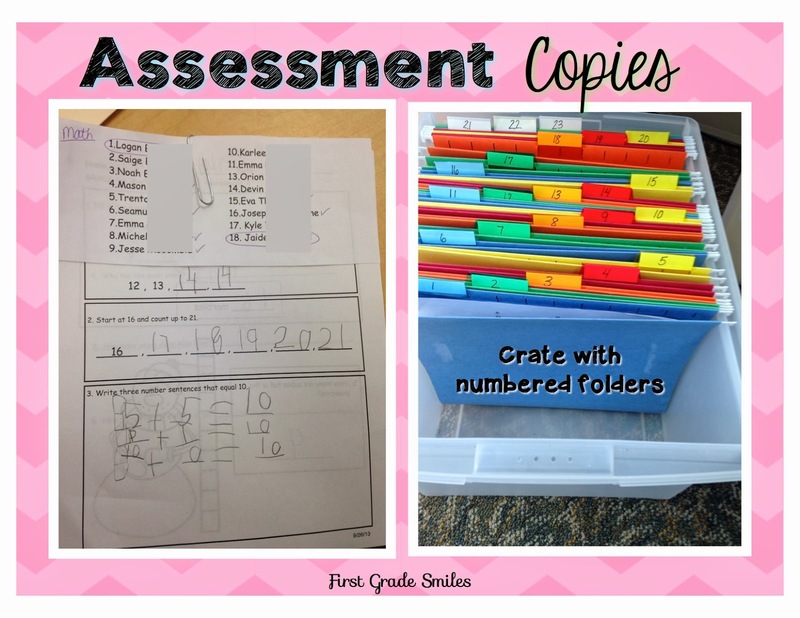 These are very creative ways of organizing your students’ records! It surely lessens the stress of having to do a lot of paperwork. It helps that your binders and folders are colorful, so the monotony of keeping tabs with all the records is somehow mitigated. Thanks for sharing! I love these ideas thank you for sharing. 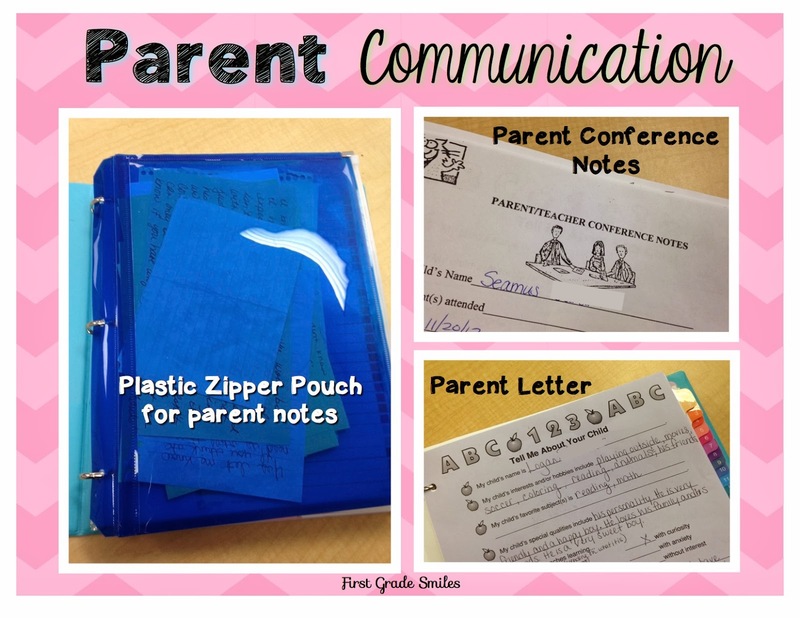 I have something very similar for parent communication, I just use plastic page protectors for small notes, or late passes instead of zipper pouches. This is wonderful and has been very helpful last year. 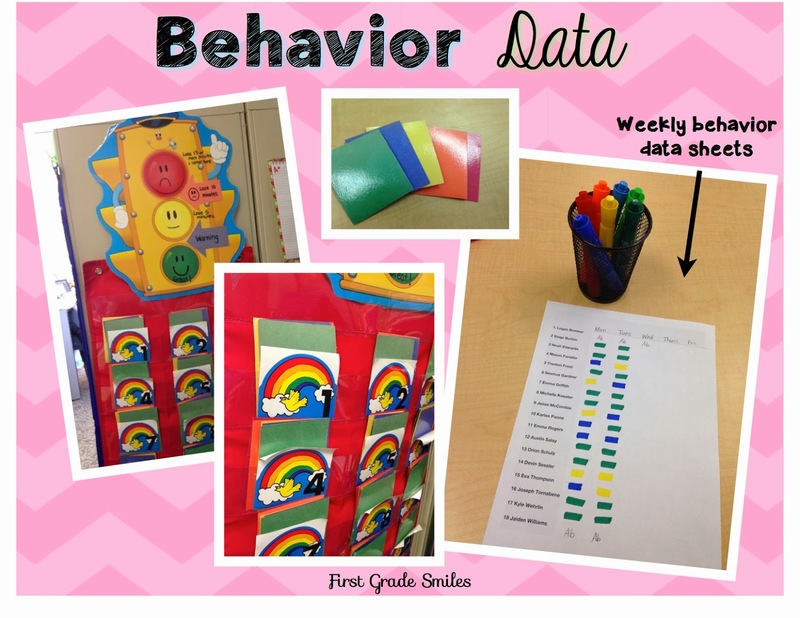 I love adding the weekly behavior charts to track data and the assessment data. Can you share where you got the math fluency data and sight word data pages?